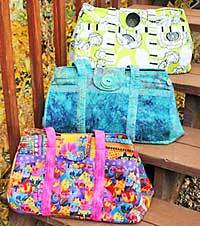 The Big Easy Expanding Tote Pattern opens up to a larger size by un-snapping, unbuttoning, and un-zipping! This tote bag has convenient double handles and a front flap. Finished size can open up to 18"W x 12"H x 13"D and there are optional directions for a zipper.